About 1,800 applicants signed up to lease 450 Mini E electric cars. Delivery is expected in April. Mini USA is taking longer than expected to select 450 lessees for its electric car because of the deluge of about 1,800 applicants. Drivers who are chosen are expected to get cars in April. The program originally had been expected to begin at the start of the year. An additional 30 vehicles will be given to fleets and municipalities for the yearlong trial to determine whether the Mini E is commercially viable. New York will get 10 Mini E's for a unit that patrols city streets looking for potholes and graffiti. Five cars also will go to Los Angeles. The trial is being run in metropolitan New York and Los Angeles. Mini USA has whittled the applicant list to about 1,000 people. Applications are being vetted by 16 dealers — five in New York, three in New Jersey and eight in Los Angeles. 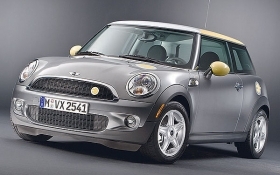 The dealers will lease and service the cars during the trial, said Jim McDowell, vice president of Mini USA. "We have to make sure their driving style fits with what we want," he said. "If you drive 200 miles a day, that's a longer daily drive than our range." Mini also required applicants to have a lockable garage so the company can install an electrical charge box. The monthly lease for a Mini E is $850. The U.S. trial originally involved 500 Mini E's. But Mini reallocated 50 to Berlin, where they will be part of an energy supplier's fleet. Parent company BMW AG wants to determine whether a market exists for an electric city car. The Mini E is the first vehicle made by BMW's Munich-based Project i, which has been charged with developing alternative powertrains for urban use.